Although they are not Longines’ biggest sellers, if there’s one thing that they can be counted on, it is that the brand will come up with some good looking vintage reissue models for their Heritage Collection. 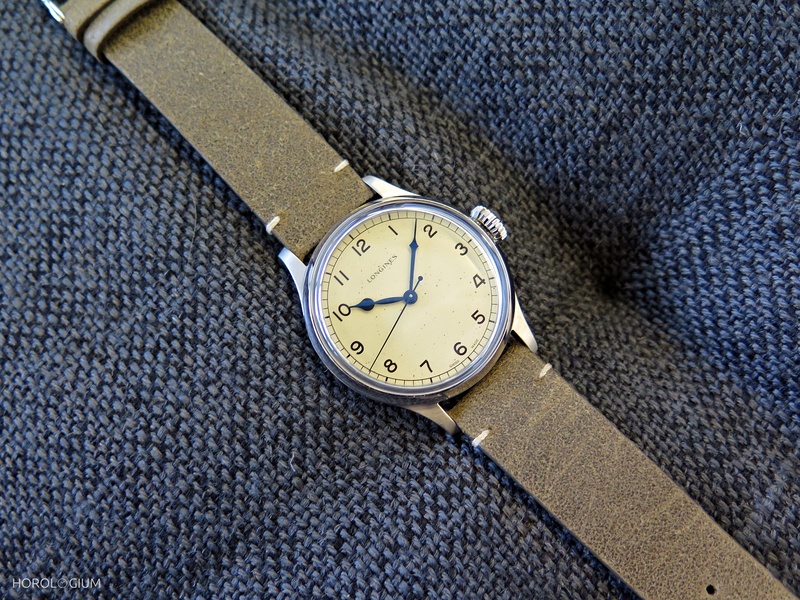 This year, it comes in the form of the rather abstractly named ‘Heritage Military Watch’, based on a watch supplied to the Military of Defence/ British RAF during WWII (Mil-spec 6B/159) that was given to pilots. The 6B/159 watches from this period were supplied by a number of manufacturers including Omega, Jaeger Le-Coultre, Ebel, Waltham, Movado, and Longines, and were characterised by a white dial with black Arabic numerals, centre seconds, and blued steel non-luminous hands. One of the most interesting aspects of this new piece is the speckled cream-colour faux patina dial which has been done rather nicely. Longines have, thankfully, kept things as accurate as possible with the dial, keeping the black Arabic numerals, centre seconds, blue spade hands, railroad seconds track and, thankfully, refraining from putting ‘automatic’ on the dial. The original 6B/159 used a manual-wind movement, but its modern descendant has an automatic Longines Calibre L888 (ETA A31 base) with sixty-five hours of power reserve. Longines have also (thankfully) refrained from adding a date function, as is often their wont when it comes to heritage remakes. This stainless steel (the original was chrome) heritage model is a modern 38.5mm in diametre, considerably larger than the original 32mm but comfortably (if even modestly) sized by contemporary standards. It has a slim profile, and the case has a mix of vertically brushed and polished finishing. For purists, a modern remake with a manual-wind movement (and perhaps a fabric strap) probably would be the only significant thing to be changed, but modern preferences are more for automatic watches, and these simply appeal to more people than those that need to be hand wound. All in all, there’s a lot to like about this new release. Keeping the original look, a better-than-some faux patina dial, and the use of a sub-40mm sized case all come together into a very wearable watch. With a release date in the fourth quarter of this year the RRP will be USD 2,150/ GBP 1,460.00.